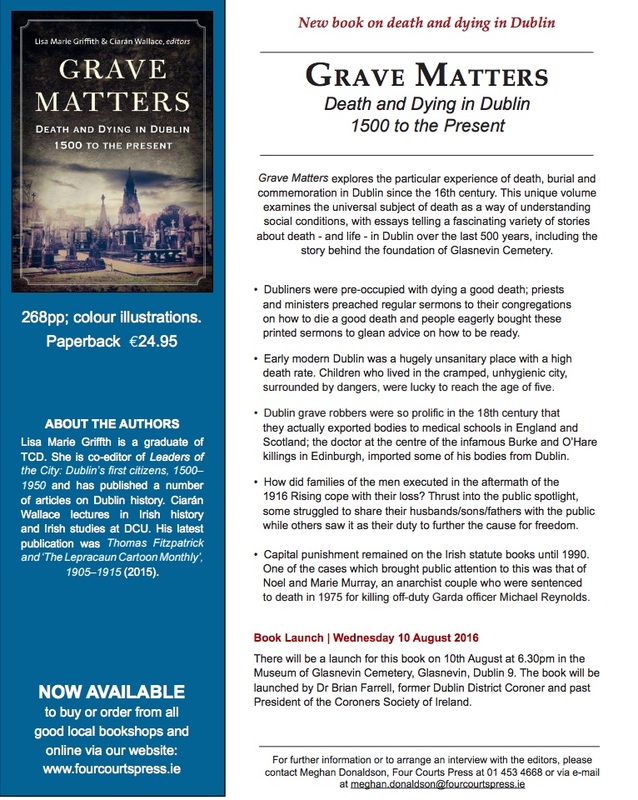 Grave Matters examines the universal subject of death – looking at the particular experience of death, burial and commemoration in Dublin since the sixteenth century. Using death as a way of understanding social conditions, contributions consider the role of the public funeral in establishing political hierarchies, the fate of the city’s Catholics during the era of the penal laws and the survival of the death penalty to 1990. They also explore the meanings of humble headstones, elaborate memorials and post-mortem photography. From Sir Francis Agard’s elite funeral in 1577, through the panicky burials during the Spanish flu in 1919, to the presentation of cemeteries as cultural tourism today, this handsomely illustrated collection offers a fascinating analysis of life – and death – in Dublin. Lisa Marie Griffith is a graduate of Trinity College Dublin where she completed a PhD on 18th-century Dublin merchants. She is the author of Stones of Dublin: A history of Dublin in Ten Buildings and has published a number of articles on Dublin history. She is co-editor, with Ruth McManus, of Leaders of the City: Dublin’s first citizens, 1500–1950 (2013). Ciarán Wallace lectures in Irish history and Irish studies at DCU, Mater Dei campus. His latest publication was Thomas Fitzpatrick and ‘The Lepracaun Cartoon Monthly’, 1905–1915 (2015).